Conor Chaplin tweeted his backing for Pompey after firing Coventry’s winner in a spectacular game at Sunderland – a goal that really helped to lift Kenny Jackett’s Blues in the League One promotion race. The former Fratton Park striker did the damage to Sunderland in a 5-4 win after coming off the bench. 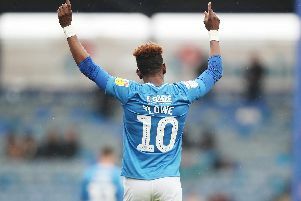 That has now put automatic promotion back in Pompey’s hands after the big victory against Rochdale. Fans rejoiced at Fratton Park on Saturday and sang Chaplin’s praises. The striker responded by showing his love for the club where he progressed through the academy. Chaplin was also booked for excessive celebrating after scoring in the 78th minute.